KOLKATA/SILIGURI: Prime Minister Narendra Modi launched an all-out attack from Bengal on both the Congress and the Trinamool Congress on Wednesday, choosing the Kolkata venue to target his principal national rival, the Congress, and focusing on the major state-level player, the Trinamool, in his Siliguri speech. “Some people in their hate for Modi have started speaking against India. Who doubted the (post-Pulwama) air strike? Who demoralised the armed forces? Who asked for terrorists’ body count?” he asked. The armed forces always had the option to go for “surgical strike”, Modi said. “But Congress-led governments did not have the guts to give a free hand to the armed forces,” he said, adding that Congress governments had compromised with terrorism, too, by revoking the Terrorist and Disruptive Activities (Prevention) Act (TADA). 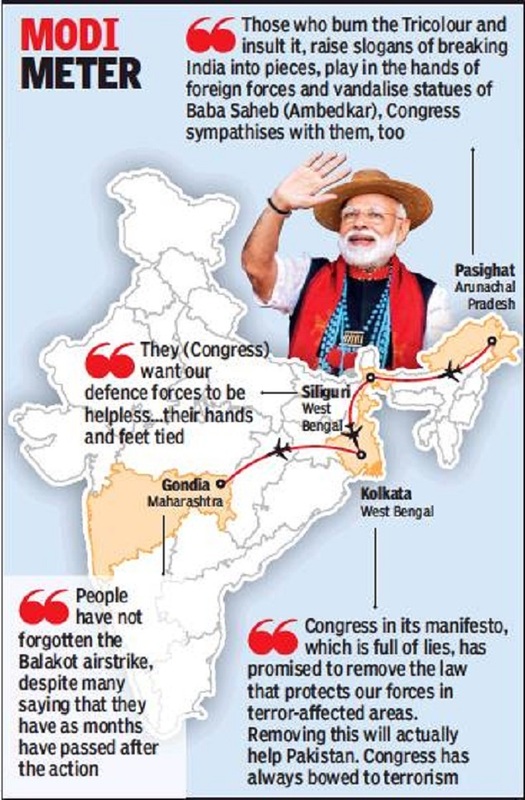 The PM reminded the Kolkata crowd about the mahagathbandhan rally at the same venue two months ago, when opposition leaders from across the country came down in response to Bengal CM Mamata Banerjee‘s United India call. “There was a mela. Netas from across states came here on a single-point Modi hatao agenda. What harm have I done to people in the last five years? I gave houses and toilets to the poor, reached households with cooking gas and electricity, made arrangements for free treatment of the poor,” he said. Less than three hours earlier, in a speech delivered more than 550 km away in Siliguri in north Bengal, Modi targeted the Bengal CM, blaming “speed-breaker” Didi for coming in the way of Bengal’s development. The seven-phase vote in the state starts with two north Bengal seats, Alipurduar and Coochbehar, on April 11. Modi then targeted the Trinamool for seeking a body count of terrorists killed by the post-Pulwama air strike on Pakistan’s Balakot. “Some of our own were pained when the Indian Air Force entered Pakistan and hit terror camps. Didi felt the pain more than Islamabad and Lahore. Anti-BJP leaders became a darling of the Pakistan media. But all these did not deter this chowkidar from taking action against terrorists,” Modi said, referring to himself in the third person. Modi also sent out a warning to those on “Trinamool payroll trying to spread terrorism in Bengal”. “We will take them to task as soon as the BJP comes back to office in Delhi. The jagai-madhai-gunda-ghuspetiya nexus thriving under the Trinamool regime has come to its end. Didi ki naiya dub chuki hai(Didi’s boat has sunk). Bengal has made up its mind. It won’t tolerate tolagiri and gundagiri any more,” Modi said.